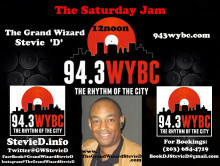 Today The Grand Wizard Stevie ‘D’ & The Great Doc-“P” Live On 94.3 WYBC-FM & 943wybc.com 12-1:30pm EST. Good morning Fam, everyone have a blessed Monday! God is good all the time, and all the time God is good!